A major feature of social insects is the existence of reproductive division of labour where one individual reproduces and is helped by a sterile worker caste. Interestingly, several ant species display natural variations in their social structures (one vs. several queens) and are thus ideal models to launch comparative studies for understanding the factors regulating polygyny. 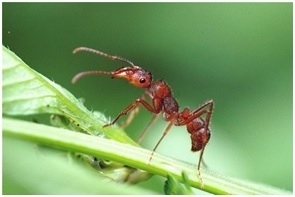 We aim at determining to what extent ants from colonies differing in their social structures show variations in the processing of social olfactory cues and how this influences the regulation of social interactions within colonies.